What can a hairstylist teach us about marketing?? I just read this article from MarketingProfs, and more than one light bulb went off! 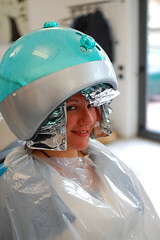 Marketing Is So Much More Than Promotion: Just Visit My Hairdresser . Besides the title of the article, reading it was more like an epiphany….what would happen if we started putting the customer first. Ok, honestly not much of an epiphany, more like a trip back to the basics. When we begin to position ourselves and our business from the eyes (or perspective) of the ones we serve, we can truly evaluate the picture. It’s almost like looking in the mirror. Sometimes we avoid it because we aren’t happy with what we see; sometimes we look past it because we want to see more than is really there; why not look directly at it and discover what the mirror truly reveals. Your business is a reflection of you. Why not strive to be your best at all times?! Moving past the reflection, you have to also make time for strategy. It’s easy to jump into the work…but what are you working for? 1. Who am I? What am I known for? 3. Who is my ideal client? Where can I find them? 4. What will make my client come back (stay)? 5. Am I providing the service my client needs? (Am I meeting my client’s needs?) How do I know? 6. Will my client refer me to their friends? 7. Do I have processes in place to attract & retain both clients and employees? 8. Do I have a clearly defined sales goal? business goal?